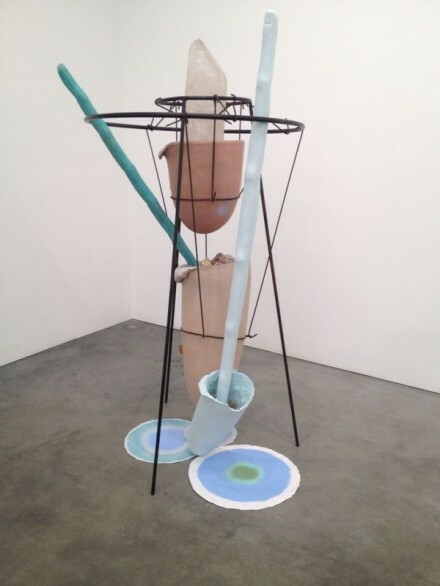 Crystals, sponges, glass vessels and ceramics are among an array of materials on view at the current exhibition of new work by Tunga at Luhring Augustine’s Chelsea location. During a career spanning over four decades, Tunga has presented a body of multidisciplinary work, finding inspiration in poetry, physics and alchemy to create intricate, symbolic work that presents a visual challenge to the viewer. Marking the artist’s fifth collaboration with the gallery, From ‘La Voie Humide’ underlines the artist’s strong interest in a multi-disciplinary approach to art, comprising a large selection of mediums and undertones running throughout the body of the exhibition. Placed as compact arrangements charged with individualistic narratives, the tripodal sculptures Tunga has incorporated a selection of metaphorical attributions in their free ranging structures. Patterns and colors are given their own space, with encouragement to grow and develop through the viewer’s eyes. Holding a large variety of representational and abstract forms in their compositions, these tripods strongly echo the relics of totemic rituals. 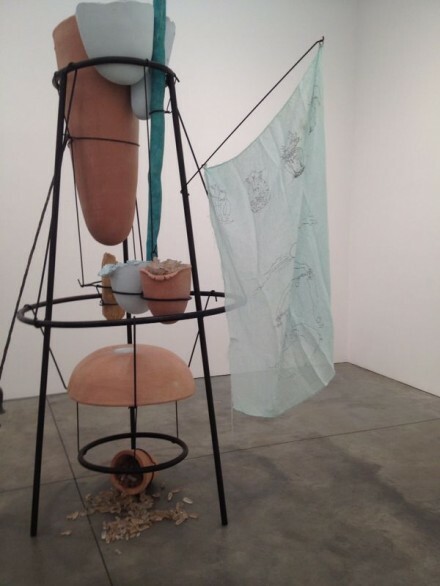 Their surreal and non-declarative compositions strongly encourage a variety of interpretations of these sculptures, repeatedly presenting certain components, such as fingers, clay pots and crystals, nestled delicately among the structures’ many folds and curves. Attributing further values to certain materials such as clay, sponge or crystal well beyond their utilitarian aspects, Tunga’s sculptural works emphasize the harmony of these unrelated natural materials. 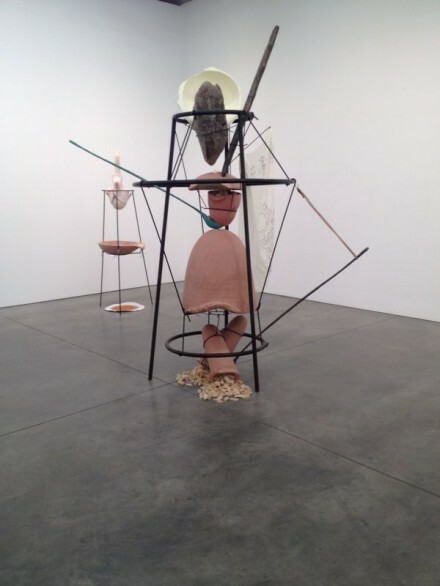 As hybrids of a variety of earthy elements, tripodal sculptures give hints of a fictional tribal ritual or uncanny formations of an ambiguous land. It’s the sort of work that makes the artist’s parallel practice to that of the Brazilian neo-constructivists of the late 60’s and early 70’s all the more interesting. While material composition and formal purity remain hallmarks of his work, the act of harmony, of incorporation and pluralism that dominates Tunga’s work sets him apart. Tunga’s ink drawings, on the other hand, made on diaphanous paper, stand out as the free-roaming reflections of his large scale tripodal sculptures, relating to familiar inspirations and concepts. 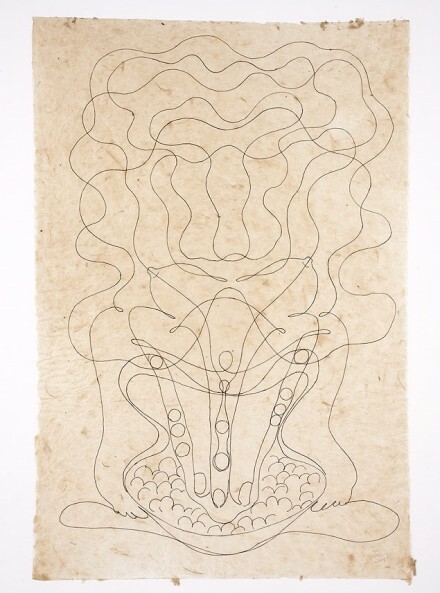 Drawn as one single continuos line, these works bear connections to Tunga’s search for further meanings in contemporary art practice through primitive approaches. Evoking the notions of a pre-scientific iconography, Tunga’s ink drawings impress with their anthropomorphic structures, while their partly abstract forms lead to varied interpretations. Embracing a fluid exchange between natural iconography and compositional rigorousness, Tunga’s From ‘La Voie Humide’ is on view at Luhring Augustine through May 31, 2014. This entry was posted on Saturday, May 24th, 2014 at 12:00 am	and is filed under AO On Site. You can follow any responses to this entry through the RSS 2.0 feed. You can leave a response, or trackback from your own site.